It doesn’t matter if it is a budget AR-15 or a high-end AR-15, we’re all looking for the best bang for our buck. So what AR-15 parts should be upgraded before others? With so many excellent AR-15 parts and upgrades available to choose from, it is easy to get overwhelmed by the myriad of choices. What makes this $200 stripped upper receiver better than a $100 upper receiver? Should I get an ambidextrous charging handle? What muzzle device is the most effective? Should I get a red dot or variable magnified optic? What barrel length should I choose? What AR-15 parts should be “splurged” on before other upgrades? While we would all love a top of the line custom AR-15 built by skilled professionals, not everyone can afford a $4,000+ high end AR-15 rifle. Even so, it doesn’t matter if it is a budget AR-15 or a high-end AR-15, we’re all looking for the best bang for our buck. Building your own AR-15 or possibly starting with a stock AR-15 and upgrading specific parts on the AR-15 are great ways to get the best bang for that buck. The plethora of AR-15 part choices is a blessing and a curse. The readily available parts variety allows us to custom tailor our AR-15s to our preferences, use cases, aesthetic choices, and budgets. But the plentiful parts availability can result in low-quality parts hitting the market, good products but only useful for certain circumstances, and the like. On top of that, quality, high end AR-15 parts don’t always work well when paired together, but work very well when paired with other rifle parts. Since it is so easy to build an excellent AR-15, it is just as easy to build a dud of an AR-15. So what AR-15 parts should be upgraded before others? While upgrading the rifle trigger won’t make the rifle mechanically more accurate, it will allow the shooter to improve their performance. Standard mil-spec AR-15 triggers are heavier than most triggers and gritty. This heavy, inconsistent trigger pull can result in missed shots. Standard mil-spec triggers aren’t bad triggers, but they aren’t good triggers. Upgrading to a smooth, crisp, and consistent trigger is an excellent way to improve a shooter’s capabilities with their AR-15. A smooth, lighter, and consistent trigger helps marksmen to be faster and more precise. Like an AR-15’s trigger, the rifle’s optics don’t make the rifle mechanically more accurate. However, they help the shooter perform better. Adding a magnified optic aids in identifying targets and making accurate long shots. Or a high-end optic can help reduce weight and increase durability for a duty rifle. And all increased budget optics improve in glass quality which provides extra clarity. Bumping an AR-15’s optics budget is a dangerous game. Getting addicted to high-end optics can get expensive very quickly. But once you buy your first crystal clear glass, you’ll fall in love and not want anything of lower quality on any of your other rifles. Thankfully, there are many good bang for the buck optics in the budget range. A Sig Sauer red dot can provide a fantastic boost to a shooter’s performance with an AR-15, without breaking the bank. Or step up to a Leupold Mark 6 1-6 magnified optic for some long distance precision and fast CQB action. There are many optics on the market, more than the average shooter can even dream of getting their hands on. However, don’t forget to use a quality optics mount on your AR-15’s optics. A high-end Leupold Mark 8 is worthless if the scope mount is low end and jiggles loose during recoil. Though it is a bit of a classic, an AR-15 with an A2 triangle front sight does not have a free float barrel. The A2 front sight on an AR-15 is the triangle shaped front sight, such as the iron sights from Vietnam era M-16s. A non-free float barrel means there is extra material in contact with the barrel of the rifle, which reduces accuracy. While many AR-15s on the market already come with a free-float barrel, not all of them do. Switching to a free float barrel on your AR-15 provides a nice accuracy boost with minimal cost and effort. Simply buy a free float barrel, which usually comes with a barrel nut, and swap out the triangle front sight with a low profile gas block. Since we’re mentioning gas blocks, an adjustable gas block is an excellent way to reduce an AR-15’s recoil and really tune in your rifle’s performance, especially if you shoot suppressed. Most AR-15 barrels from reputable manufacturers perform quite well – well enough for most shooters. 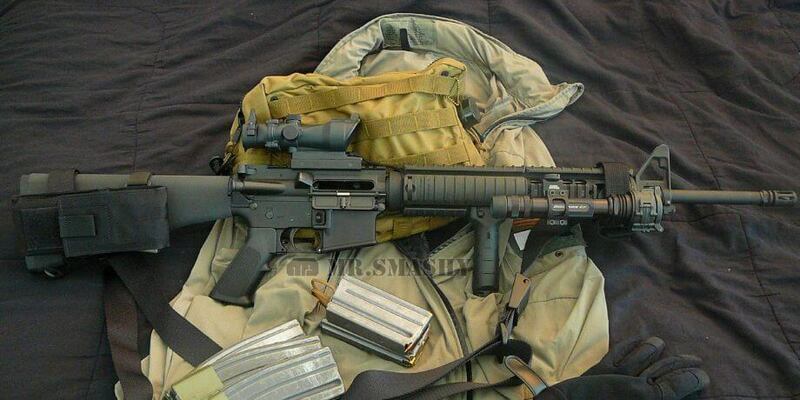 Modern firearm manufacturing has come a long ways compared to when the M-16 first came out. These barrels are by no means inaccurate, however, they do have limitations to their accuracy. If a shooter has already invested time in training and is not seeing a reduction in group size, then upgrading the AR-15’s barrel is an excellent way to tighten up those groups a little more. For example, Odin Works’ AR-15 barrels guarantee 1 MOA accuracy or better and are a great way to improve an AR-15’s accuracy. Are you a little concerned about disassembling and assembling an AR-15 upper receiver, but still want a free-float barrel and/or a match grade barrel? Not a problem. Complete AR-15 upper receivers come pre-assembled, and ready to go. There are many excellent manufacturers providing extremely accurate assembled upper receivers. This will be a controversial item on the list of AR-15 parts to splurge on. There’s a bunch of strong opinions one way or another when it comes to suppressors. But in my opinion, shooting suppressed rifles is a great experience, particularly for extended training sessions. A rifle suppressor should definitely be at the bottom of the upgrade list, but is well worth considering, should your state’s laws allow it. It is difficult to convey the “why” of shooting suppressed through words, or even through video. 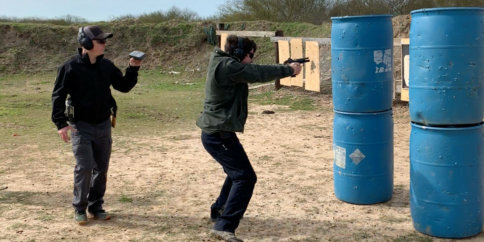 Shooting a suppressed firearm is a simply a great experience. 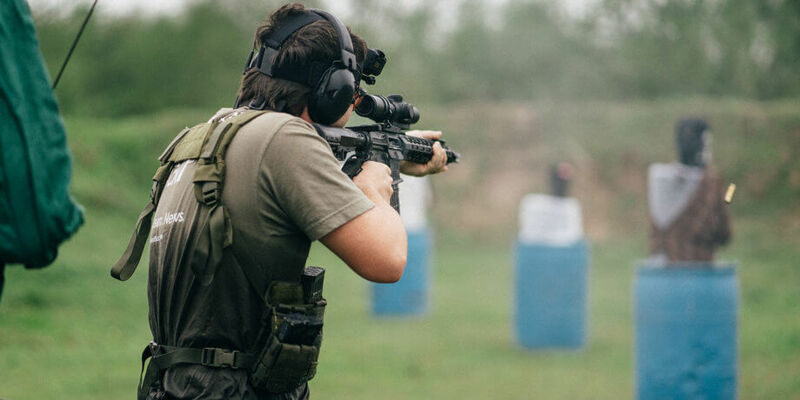 Obviously, a suppressor reduces an AR-15’s noise to prevent long-term hearing damage, but it also reduces the concussive blast, felt recoil, and muzzle climb. Also, due to the increased velocity, a suppressor provides as well as added weight for stability, a quality rifle suppressor can even improve accuracy. After an extended shooting session or rifle class with a suppressor, you’ll never want to go back to shooting unsuppressed. And not only does a suppressor make an excellent upgrade to an AR-15, through the purchase of a .30cal suppressor, one suppressor can be used on multiple rifles, even up to .300 win mag with the right suppressor! So this upgrade can be used on almost all of your rifles, not just your AR-15, helping make the purchase a better bang for the buck. I am sure this item on the AR-15 upgrades list will also be met with some controversy, just like the suppressor addition. I almost didn’t even include it in the upgrade list, which is why it is an honorable mention. An upgraded AR-15 lower receiver with fully ambidextrous controls is mainly a benefit to any shooter who needs fast reloads and other rifle manipulations under time. However, since you can buy one upgraded AR-15 lower receiver and swap out any number of styles and calibers of AR-15 upper receivers, it made the list. However, it has the disclaimer: this isn’t an upgrade everyone needs nor will a lower receiver improve an AR-15’s accuracy. Most AR-15s are standard mil-spec AR-15 lowers, that is perfectly fine – I am by no means saying mil-spec lower receivers are bad. Aside from the cosmetic etchings, almost all AR-15 lower receivers the same, often even made in the same factories. However, recently there has been a growth of enhanced and ambidextrous AR-15 lower receivers on the market. These lower receivers can feature an ambidextrous bolt release and magazine release, as well as flared magwells and built in sling attachment points. Some lower receivers even have lightening cuts to recude the AR-15’s weight. If you are interested in competitive shooting, an ambidextrous lower receiver can speed up weapon manipulation, shaving off precious time. Why aren’t the other AR-15 parts selected? Why aren’t AR-15 parts like a BCG, upper receiver, or stock on the list? The majority of the differences of other parts, like a BCG or rifle stock, are all minimal. They don’t improve the mechanical accuracy of the rifle nor do they help the shooter perform better by shooting significantly faster or more accurately. Most of those part upgrades are for ergonomics, minimal weight reduction, or a slight improvement in reliability and durability. The accuracy exception is the BCG, a good matched BCG can slightly improve accuracy, but there isn’t as significant of a return on investment as other AR-15 parts. While upgrading the stock can provide a more pleasant shooting experience, or a nicer upper receiver can shave off an ounce or two, it doesn’t help the flight of the bullet remain consistent from shot to shot. The provided AR-15 part recommendations all help the shooter perform better, improve the mechanical accuracy of the firearm, or improve the shooter’s manual of arms. What’s your favorite AR-15 upgrades? I would add a good bolt that was pressure tested and magnetic particle inspected.